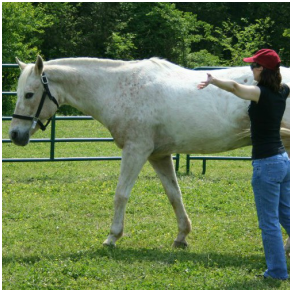 Equine Assisted Psychotherapy (EAP) utilizes horses for emotional growth and learning. It is a collaborative effort between a mental health professional and a horse professional working with clients and horses on the ground to address treatment goals. Visit our Retreats or Therapy page to begin your Equine Assisted Psychotherapy. Equine Assisted Learning (EAL), while similar to EAP, utilizes horses for growth and learning and is especially suited for groups and corporations. 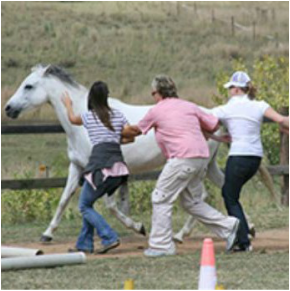 EAL uses on the ground horsemanship to promote team building and develop working relationships outside of a corporate setting. Visit our Teambuilding page to learn how to bring EAL to your group. "Put your heart in your hand and touch your horse with your heart." "Equine Therapy for Human Healing and Empowerment"